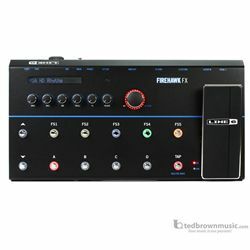 Whether you’re recording in the studio, playing on stage or working on new song ideas, Firehawk® FX offers the tone, power and versatility you need to deliver your best performance. The innovative Firehawk Remote app for iOS and Android gives you the power to find the perfect tone faster than ever. And it’s loaded with great sounding amps and effects modeling. It’s not just a multi-effects—it’s the centerpiece of your entire guitar rig.